MEDIUM RECTANGLE Dimension: 300X250 pixels. Max File Load Size: 200 KB. File Formats: JPEG, GIF, PNG. HTML5: Yes, accepted. Third Party Tags Accepted: Complete Third Party Tag, Third Party Impression Tag, Third Party Click Tag. URL: Click thru URL required. Animation: Limited to one loop not to exceed 15 seconds. Mobile View: Banner runs on mobile. No further assets required. Deadline: 10 days prior to launch. MEDIUM RECTANGLE WITH RICH MEDIA Collapsed Dimension: 300×250 pixels. Expanded Dimension: 600×400 pixels. Max File Load Size: 300 KB. File Formats: JPEG, GIF, PNG. Third Party Tags Accepted: Complete Third Party Tag. URL: Click thru URL required. Z-index: 999 or below. Mobile View: Not available. Deadline: 10 days prior to launch. RECTANGLE BUTTON Dimension: 300X90 pixels. Max File Load Size: 80 KB. File Formats: JPEG, GIF, PNG. HTML5: Yes, accepted. Third Party Tags Accepted: Complete Third Party Tag, Third Party Impression Tag, Third Party Click Tag. URL: Click thru URL required. Mobile View: Banner runs on mobile. No further assets required. Deadline: 10 days prior to launch. LEADERBOARD Dimension: 728×90 pixels. Max File Load Size: 200 KB File Formats: JPEG, GIF, PNG. HTML5: Yes, accepted. Third Party Tags Accepted: Complete Third Party Tag, Third Party Impression Tag, Third Party Click Tag. URL: Click thru URL required. Animation: Limited to one loop not to exceed 15 seconds. Optional Mobile Dimension: 320×50 Pixels. Mobile Size: 80KB Deadline: 10 days prior to launch. MENU BAR NAVIGATION (MEDIUM RECTANGLE) Dimension: 300X250 pixels. Max File Load Size: 200 KB. File Formats: JPEG, GIF, PNG. HTML5: Yes, accepted. Third Party Tags Accepted: Complete Third Party Tag, Third Party Impression Tag, Third Party Click Tag. URL: Click thru URL required. Animation: Limited to one loop not to exceed 15 seconds. Mobile View: Not available. Deadline: 10 days prior to launch. 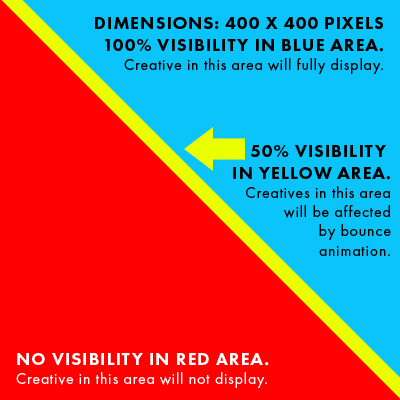 300×600 BANNER Dimension: 300X600 pixels. Max File Load Size: 300 KB. File Formats: JPEG, GIF, PNG. HTML5: Yes, accepted. Third Party Tags Accepted: Complete Third Party Tag, Third Party Impression Tag, Third Party Click Tag. URL: Click thru URL required. Animation: Limited to one loop not to exceed 15 seconds. Mobile View: Banner runs on mobile. No further assets required. Deadline: 10 days prior to launch. SKYSCRAPER TAKEOVER PACKAGE Dimensions: Two (2) 160×600 pixels. One (1) available ROS banner (300×250 or 728×90). Max File Load Size: 100 KB. File Formats: JPEG, GIF, PNG. HTML5: Yes, accepted. Third Party Tags Accepted: Complete Third Party Tag, Third Party Impression Tag, Third Party Click Tag. URL: Click thru URL required. Animation: Limited to one loop not to exceed 15 seconds. Mobile or Tablet View: Not available. Deadline: 10 days prior to launch. 970×66 AD BANNER Dimension: 970×66 pixels. Max File Load Size: 100 KB File Formats: JPEG, GIF, PNG. HTML5: Yes, accepted. Third Party Tags Accepted: Complete Third Party Tag, Third Party Impression Tag, Third Party Click Tag. URL: Click thru URL required. Animation: Limited to one loop not to exceed 15 seconds. Optional Mobile Dimension: 320×50 Pixels. Mobile Size: 50KB Deadline: 10 days prior to launch. PUSHDOWN (THIRD PARTY) Collapsed Dimension: 970×66 pixels. Expanded Dimension: 970×418 pixels. Max File Load Size: 1 MB. File Formats: HTML5. HTML5: Yes, accepted. Third Party Tags Accepted: Complete Third Party Tag. URL: Click thru URL required. Z-index: 999 or below. Optional Mobile Dimension: Expanded 320×480 Pixels/Retracted 320×50 Pixels. Max File Load Size: 200KB. Deadline: 10 days prior to launch. PUSHDOWN (IN-HOUSE) Assets: Client Supplied. Collapsed Dimension: 970×66 pixels. Max File Load Size: 200 KB. Expanded Dimension: 970×418 pixels. Max File Load Size: 300 KB. File Formats: JPEG, GIF, PNG. HTML5: No, not accepted. Third Party Tags Accepted: Third Party Impression Tag, Third Party Click Tag. Click/Tracking Options: Static URL, Third Party Click Tag, Third Party Impression Tag. Clickable Areas: Two clickable areas available within expanded view. Optional Mobile Dimension:Collapsed 320×50 Pixels. Max File Load Size: 100KB. Expanded 320×480 Pixels. Max File Load Size: 200KB. Optional Video: Include video within expanded view. Video Formats: MP4 or WEBM. Required Poster Image: Static graphic placeholder that displays during loading and after video has stopped. Poster Image Dimension: 720×406 pixels. Deadline: 10 days prior to launch. PEELBACK (IN-HOUSE ONLY) Assets: Client Supplied. Collapsed Dimension: 100X100 pixels. (Example) Max File Load Size: 50 KB. Expanded Dimension: 400X400 pixels. (Example) Max File Load Size: 200 KB. File Formats: JPEG, GIF, PNG. HTML5: No, not accepted. Click/Tracking Options: Static URL, Third Party Click Tag, Third Party Impression Tag. URL: Click thru URL required. Visible Area: Peel over only displays half of a square graphic which cuts in a triangular shape from the top left corner to bottom right corner. Display Action: User initiated. Mobile View: Not available. Restrictions: Cannot use third party served ads. Deadline: 10 days prior to launch. Recommendations: Try to keep important branding and messaging away from the yellow dividing area that might have partial coverage. INTERSTITIAL (IN-HOUSE) Assets: Client Supplied. Dimension: 640X480 pixels OR 500X500. Max File Load Size: 300 KB. File Formats: JPEG, GIF. HTML5: No, not accepted. Third Party Tags Accepted: Yes. Click/ Tracking Options: Static URL, Third Party Click Tag, Third Party Impression Tag. URL: Click thru URL required. Optional Mobile Dimension: 320×480 Pixels. Max File Load Size: 200KB. Animation: Limited to one loop not to exceed 15 seconds. Deadline: 10 days prior to launch. IN-BANNER VIDEO Playback: Autostart. Audio: User Initiated / Mute on start. File Formats: MP4/H.264, WebM, VP8. Acceptable formats requiring conversion: WMV, MOV. HTML5: No, not accepted. Recommended Video Length: 15 – 30 sec. Max File Load Size: 50 MB. Recommended Video Frame Rate: 24 – 30 FPS. Recommended Video Aspect Ratio: 16:09. Click/Tracking Options: Static URL, Third Party Click Tag, Third Party Impression Tag. Mobile View: Banner runs on mobile. No further assets required. Deadline: 10 days prior to launch. NATIVE CONTENT MODULE: Client to supply 2-3 800×600 images to accompany article (editorial team will only chose one photo to accompany native content module) Client to supply two banner ads (one 300×250, one 728×90) File formats: GIF, JPEG (no Flash files can be used). File Size: 50K max. Animation: GIFs accepted Requirements: URL location for click-through. Deadline: 10 days prior to launch Note: Editorial team must be aware of chosen topic for native content module at least a month in advance of run date. Client has the right to approve facts of the article, but not the content. Facebook post will be boosted to targeted audience. NATIVE SLIDESHOW MODULE Client to supply 5-6 800×600 hi-res images for slideshow. Client to supply two banner ads (one 300×250, one 728×90) File formats: GIF, JPEG (no Flash files can be used). File Size: 50K max. Animation: GIFs accepted Requirements: URL location for click-through. Deadline: 10 days prior to launch Note: Editorial team must be aware of chosen topic for native slideshow module at least a month in advance of run date. Client has the right to approve facts of the slideshow captions, but not the content. Facebook post will be boosted to targeted audience. Photos, videos, GIFs, and quoted tweets do not count towards the 280-character limit. Deadline: 10 days prior to launch. File formats: GIF, JPEG, (no Flash files can be used). Third party served ads: Not Accepted File size: 50K max. Animation: GIFS accepted. Note: First frame should display intended message, older email browsers including Outlook, only render the first frame and will not run through entire animation timeline. Requirements: URL location for click-through. Deadline: 10 days prior to issue. (1) 728×90, (3) 300×250 (1) Feature Story – Sponsored content in Recommend Spotlight and on recommend.com*. File formats: GIF, JPEG, File Size: 50K max. * Sponsored content on Recommend.com must be unique content. Content published on our site should not exist elsewhere on the internet including on recommend.com as duplicate content negatively impacts Google rankings. All advertorials must pass a duplicate content check by the editorial team before being published on our website. If client wants to use content previously published on Recommend. com, client must agree that we revise the old content with an updated published date and new main image. If content needs to be rewritten by Recommend editors in order to pass a duplicate content check, a fee of $500 will be incurred.